A very timely and topical volume concerned with the impact of the Lisbon Treaty on the European Union’s (EU) capacity to further develop a distinctive foreign policy in accordance with the various policy instruments necessary to fulfil its role as a global actor. This edited volume brings together a host of scholars in the fields of European Studies and International Relations whose contributions offer both innovative theoretical perspectives and new empirical insights. Overall, the book emphasizes the question of the EU’s evolving legitimacy and efficiency as a foreign policy and diplomatic actor on the regional and global stage. This shared concern is clearly reflected in the book’s three-pronged structure: Part 1 - the EU a controversial global political actor in an emergent multipolar world with contributions from A.Gamble, M.TelÃ² and J.Howorth; Part 2 - After the Lisbon Treaty: the Common Foreign and Security Policy and the European External Action Service, includes chapters from C.Lequesne, C.Carta and H.Mayer; Part 3 - R.Gillespie, F.Ponjaert, G.Grevi, Z.Chen, H.Nakamura and U.Salma Bava assess the CFSP and the EU’s external relations in action. Foreword by S.E.M P. Vimont. As a result, the book is a useful and relevant contribution to European Union studies and International Relations’ research and teaching. 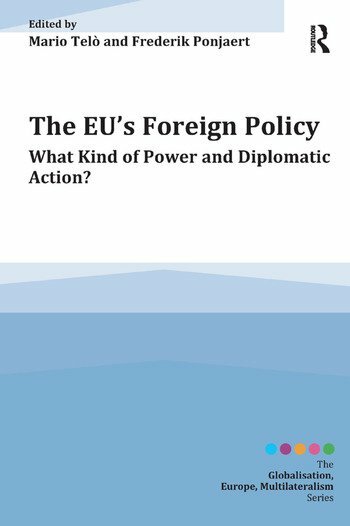 It offers any interested party informed and comprehensive insights into EU foreign policy at a time when it seeks to undertake an increased role in World affairs and this despite economic crisis. Mario TelÃ² is a member of the Royal Academy of Sciences and professor of international relations at the Université Libre de Bruxelles, and of EU institutions at LUISS University, Rome. Frederik Ponjaert is researcher at the ULB and Katholieke Universiteit Leuven, and teaches comparative regionalism at Sciences Po, Paris.